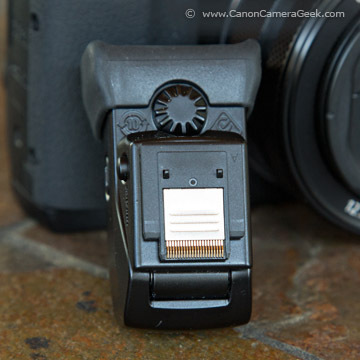 Canon G1X Mark II Viewfinder Review. Is It Really Worth The Money? The Canon G1X Mark II Viewfinder is a very pricey camera accessory that enables you to bypass the LCD screen and shoot photos just like a DLSR. 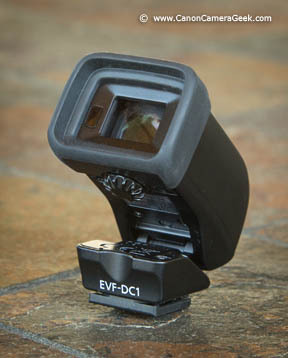 It's official name is the EVF-DC1. Your own shooting style and your budget for camera add-ons will determine if this is the right gadget for you to buy. 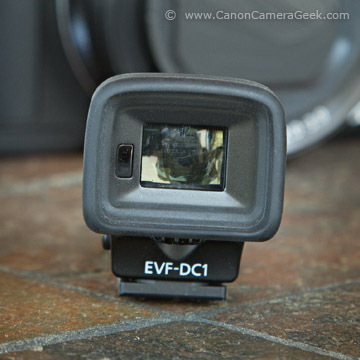 You can view several close-up photos of the EVF-DC1 here. 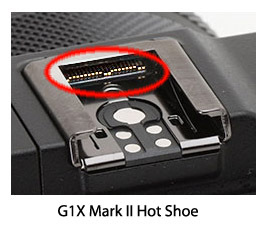 This electronic viewfinder slides onto the Powershot G1X Mark II hot shoe just like a Canon Speedlite or any other brand of flash gun. It come on automatically as soon as you raise the camera to your eye or there is a small button on the EVF-DC1 that will allow you to switch back and forth between the viewfinder and LCD screen. Another nice feature is the adjustable diopter control to match your vision whether you are wearing glasses, contact lenses or viewing through the EVF with the naked eye. The hot shoe mount has a hinge the allows you to tip the viewfinder upward, making it easy to shoot with the camera at a low vantage point. 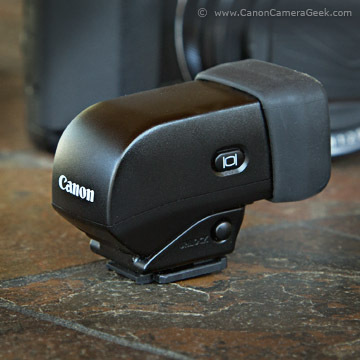 Click on any of the photos of the EVF-DC1 above to see a close-up view of this accessory. 1. Gives you a bright and exact duplication of what you see on the LCD, camera settings, focus point, image number, battery power, etc. without any interference from sunlight or reflections. 2. It's small and easy to carry. 3. 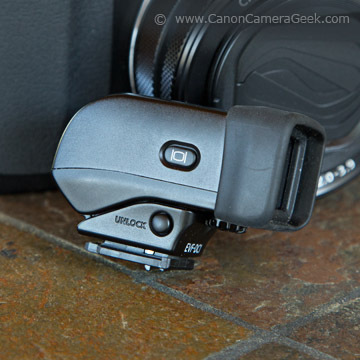 Easily tilts upward for low-angle and macro photography. 1. You can't use LCD touch screen capabilities when you're looking through the viewfinder. 2. It's not a cheaply priced accessory. 3. It adds some size to the overall camera dimensions when attached to the hot shoe. I can look through the viewfinder, see all the important camera setting and use the two adjustment rings on the lens of the G1X Mark II to make changes. Reviewing and evaluating photos already taken is so much better that trying to evaluate them on an LCD screen. It reminds me of the effect of being in a dark movie theater and having brightly lit screen in front of me. LOL. Can you tell I like this gizmo? Seriously, it is a big chunk of change, but it makes a compact camera with really good image quality work like a DLSR. Please visit one of Canon Geek's preferred vendors below. It helps keep this web site going. Thanks. 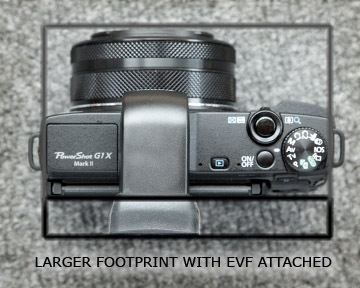 With the EVF attached, the G1X Mark II has a slightly larger footprint which could affect which camera case you use if you want to keep the EVF attached.